Chubby fingers stretched upward to the drifting whiteness. Bodies twirled. Tongues extended to catch the falling flakes. Children’s voices cried out, “Mommy! It’s snowing!” Well, sort of. The wonderment was real, but the snow was not. The flakes disappeared upon contact, dissolving into faint non-toxic bubbles, which were 90 percent water and 100 percent biodegradable. 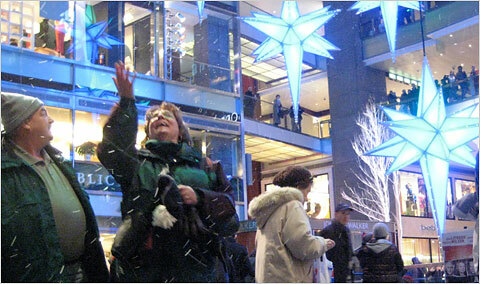 The scene took place, not under a cold winter sky, but in the warm indoor atrium of the Time Warner Center at Columbus Circle, under the glow of the Williams Sonoma, J. Crew and Borders stores. The Time Warner Center may not have the holiday windows of the city’s flagship department stores, but it can make it snow on cue — at least in limited bursts. Since Nov. 11 and ending on Dec. 21, it snows in brief spurts starting at 5 p.m. on Friday, Saturday and Sunday nights in the atrium. “We always thought this place looks a little bit like a snow globe,” Stacey A. Feder, the vice president for marketing at Related Companies, which runs the Time Warner Center. “It’s fabulous and festive and exciting,” said Laurie Giddins, who had brought her 4-year-old daughter Elena to experience the snow. Elena was suitably enchanted. “Wow!” she said, as she watched the snow. The effect is created by MagicSnow, a Los Angeles-based company started eight years ago by Adam Williams. 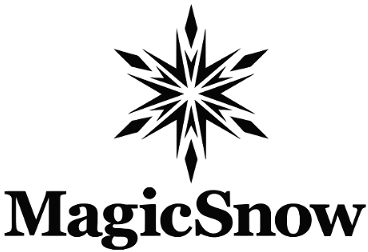 MagicSnow now works year round on snow effects, creating artificial snow for installments around the world. In the United States, the snow has become a new holiday tradition in Seattle and a sight at The Grove shopping center in Los Angeles. Mr. Williams, approached the owner of The Grove with the proposal of a magic show and artificial snow. “He wasn’t that interested in the magic show and just wanted it to snow,” recalled Mr. Williams. Creating snowfall in the Time Warner Center is not trivial. The snow couldn’t be allowed to leave marble floors slippery, the glass windows stained, or drift into an underground Whole Foods store. Time Warner and MagicSnow have been working on this project for about a year and a half. Though he does a lot of work for movies and music videos in Los Angeles, Mr. Williams, who is known as “the snow man,” also has clients who are private individuals. Wealthy clients have hired him to make it snow outside their children’s windows on Christmas morning. “We live in 80 degree weather in December, but they want that experience that you get in New York,” he said. “We are making snow for billionaires and their children.” His busiest day is usually the day before Christmas. For some, the fake stuff is first “snow” they ever see. “In these places that don’t get snow, the reaction is huge,” said Mr. Williams. At the Time Warner Center, the snowfall suddenly turned off. Four-year-old Elena looked perplexed and looked at her mother. “I want it to come back. Why are they not coming back?” she said.